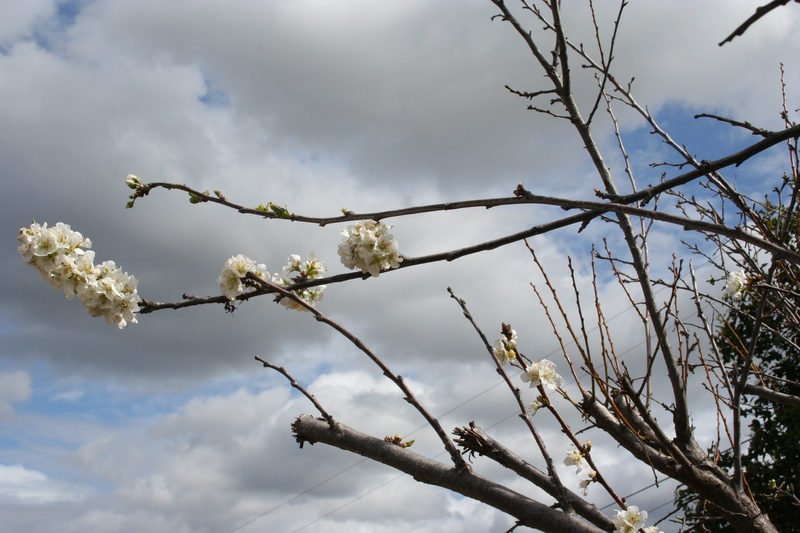 Not only is springtime a season, but, according to the dictionary, it is “the early part or first stage of something”. Are you in the “springtime” of something? …a project of remodeling the house, redecorating, planning a trip, or maybe a relationship? Beginnings can be exciting…or they may be tough… changes in a loved one’s health, a change in finances, a difficult move, or a loss of a job. But, if we hold on to all the beauty of the season, we can learn that we can look forward to blossoming in the process. Often, starting a journal is a great new opportunity for self- exploration, something I have done many times, only to abandon in the swirl of everyday life & its adventures, or busyness, or demands. I sometimes wonder what it would be like to pick up my old journal and imagine the thoughts & feelings I could have explored…the mistakes I could have predicted, and the opportunities I passed up. Oh…what I could learn from pages never written! This spring, I choose to blossom. I want to learn something new, choose to make a difference in the world around me, take a class and renew some old loves I have let go. I used to play tennis, doubles for the most part, but now with a resolved back issue, I have been thinking I might give it a try…ease back into it and see if the joy of a great serve, volley or return still brings the excitement I remember. After all the rain we have had recently, I’ve been itching to get out into my yard and do some rejuvenation. 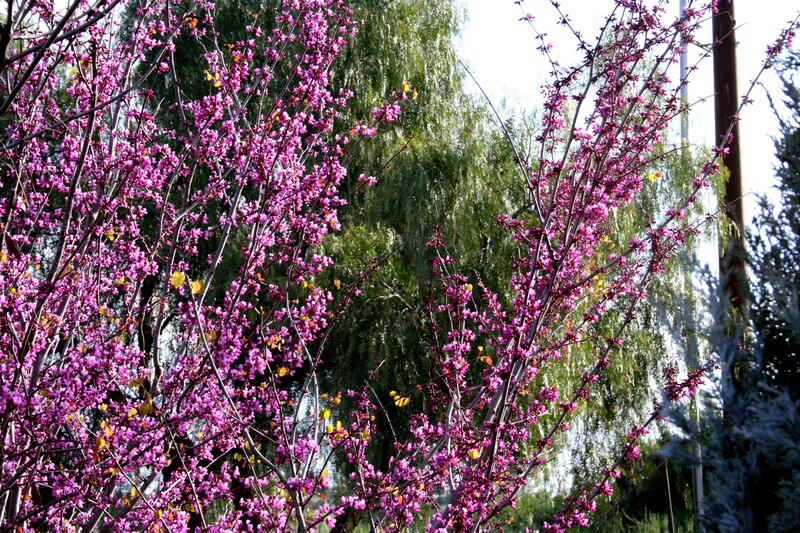 When I was out in the unexpected sunshine the other day, I was surprised by the blossoms on our Red Bud tree…and then our apple, and the peach tree too! They gifted me with the most rare, joyful, unexpected moment. Now, I’ve got to find a vase …a large one for the cut branches I plan to bring inside. One day this week, I pulled out of the garage and looked into my eclectic flower garden in the front of the house, and discovered brilliant orange Poppies. I suddenly felt the need to plant colorful perennials in every bleak and unadorned spot I could find. I absolutely yearn to take off on a site seeing jaunt to see the wildflowers announcing spring in all their glory…like the many Facebook posts I’ve seen lately. They look breathtaking with all the glorious colors. I suddenly feel spring gives us the ability, to face, overcome, and embrace whatever challenges come our way with new life. So, I’d like to encourage you to be Daffodils, Poppies, and Wildflowers this spring and brighten your world…take that hike, ride that wave, make that move, take that chance, start that class, ski that mountain. Let’s blossom together. Southern California is a great place to live…you can have snow in the mountains, and still have a great day on the beach, or in your garden, where most of us can frequently be found. The winter season does not stop us from enjoying what we love most…getting out into our gardens! Yes, even maintenance excites us. I love to zip up my sweat shirt and do some pruning, but as I do…the creative part of my brain is visualizing colors, varieties…changes for the coming year. It could be as simple as adding a bird bath, or a search for a piece of garden art. Literally, I look through antique or salvage/vintage stores hunting for the right quirky find for my garden. Who knows what interesting item I might discover? It can be anything that strikes me with a fire of inspiration. We are all familiar with the usual maintenance items for winter, but as we go about those tasks, we are working our muscles, breathing in the fresh air and (I like to think of us as artists) creating a fresh start with a list of what we need …fertilizer…a new pruner…some interesting rock? The therapy begins as we work. We solve problems that have been giving us a twitch at the corn of our eye, or giving us a stomach ache. We start to feel joy spring to life…a smile start to take shape as wrinkles between our eyes relax and begin to disappear. No matter what kind of landscape or garden you have, something is blooming and something needs to go! It’s a lot like life, right? Before you know it, I’ve filled trash cans with clippings and leaves, snipped vines that have invaded their boundaries, removed and renovated to make room for change, considered painting the iron table by the chaise lounges with a new color, and decided to try that new recipe for dinner. It’s a marvelous feeling, isn’t it! As we make room for our gardens to change and experience new growth, we do too! 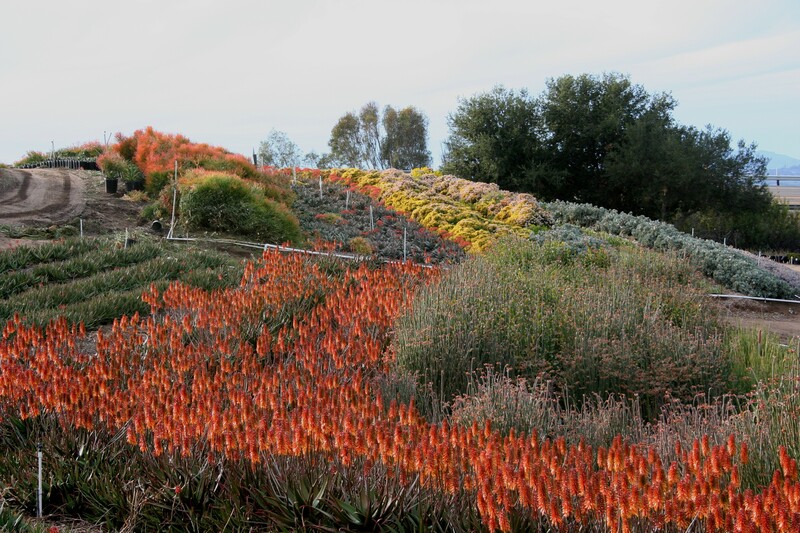 Locally, in Southern California, Aloes are blooming beautifully with brilliant orange color in the winter. It’s especially striking when I walk through the nursery around sunset and see the orange all around me… the sky, the Euphorbia tirucalli, Aloes in bloom and the reflection of it all in the ponds! 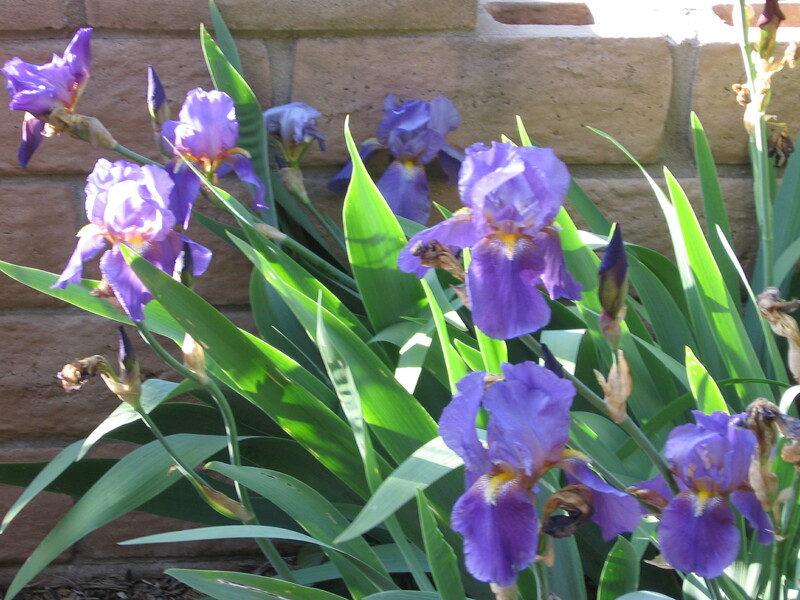 I’ve always loved Iris and have a few patches of them in the back of the house that need some thinning out. They surprise me with their varied colors, and their graceful, ruffled petals each year. Roses seem to be individuals needing pruning intermittently, but for the most part, all roses like a good trim in the winter, growing back quickly with fresh foliage and flowers. This is a season when Succulents are stressed by the cold, giving them surprising color ranges, however if you live in an area that gets much frost, be careful of your varieties and cover them when the temperatures dip. 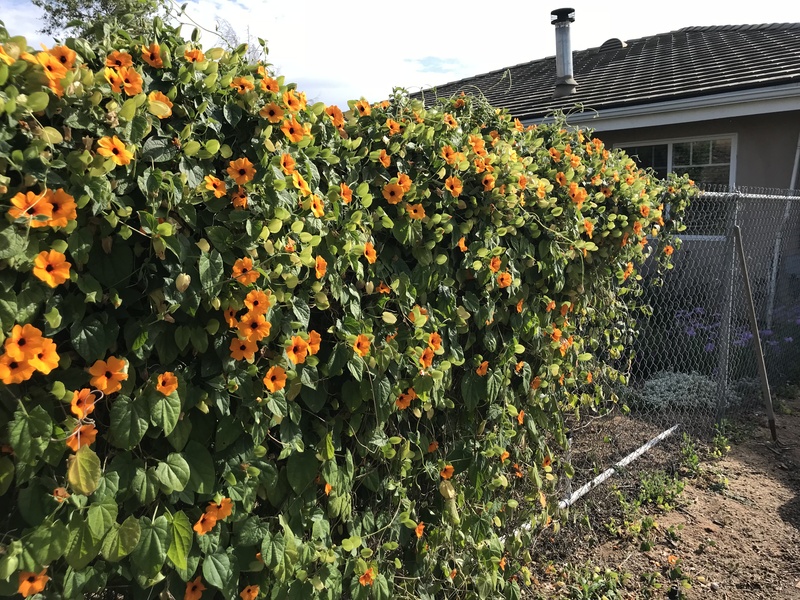 Sage and Rosemary like cool weather and perform quite well here in the winter, as well as my amazing orange, black-eyed Thunbergia vine that happily grows along a fence. I call it my happy plant! 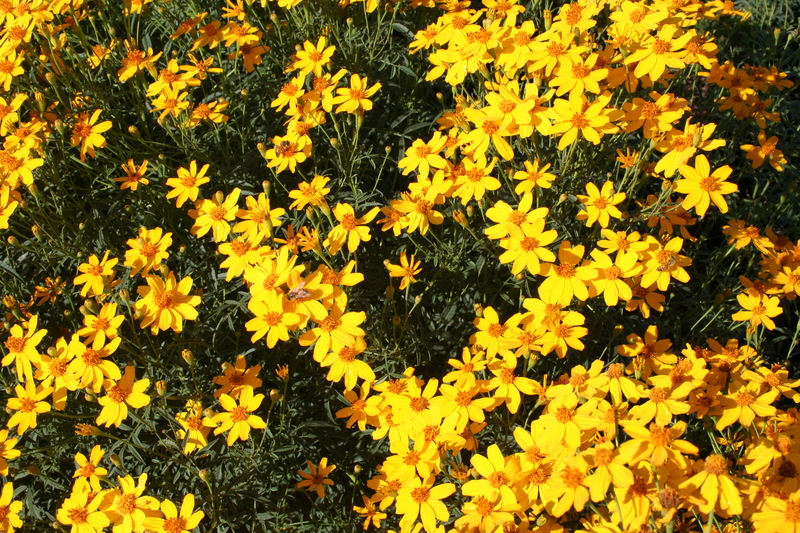 Tagetes lemonii also gives winter a burst of golden daisy-like flowers that almost makes me feel a warmth glowing from it’s golden color. 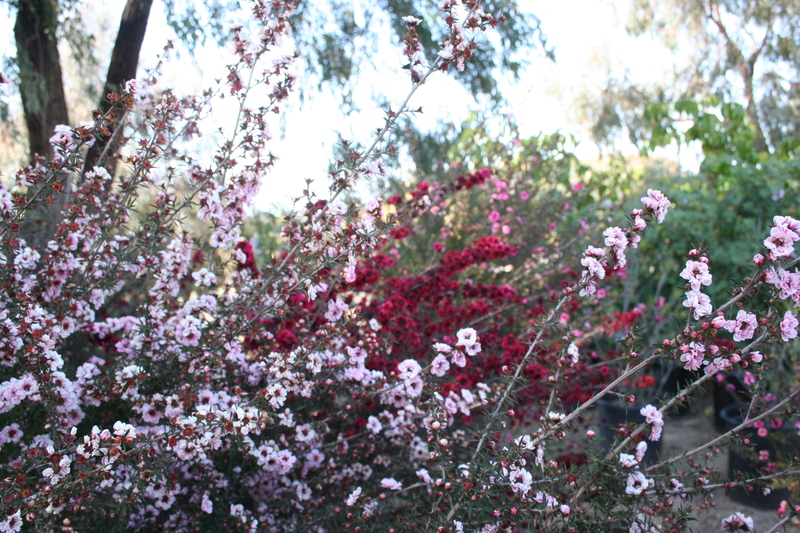 Leptospermum is bearing a flurry of tiny flowers like confetti at a New Year’s Party! One of my favorite plants ever…Lavender, will soon start blooming. I can almost close my eyes and imagine its scent. I will be filling in some spots in my garden with it, so I can enjoy the scent through springtime, but it really doesn’t like the heat of summer here in North County. 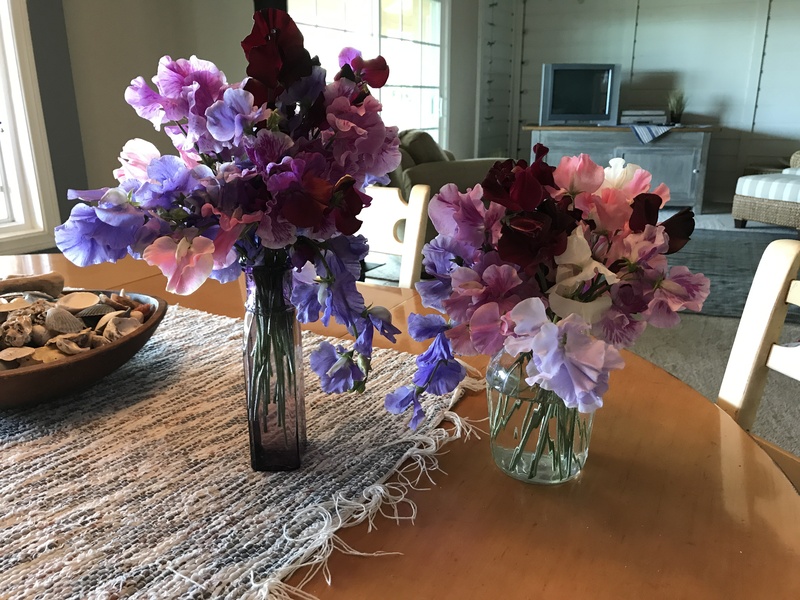 This is also the time of year for planting Sweet Peas. I have a passion for these amazing plants. They are not forever, but some of the best things in life are not. You need something for them to climb up, so I plant them next to a chain link fence dividing two spaces. Some are hardier than others, but I get mine at Rogers Gardens in Newport Beach. They come from England and are a wonder! They are so strong; they must have been raised on super vitamins. The drive to Newport is only about an hour or two depending on traffic, but it’s worth it for this great variety and picturesque destination. The colors are magnificent and abundant, but you don’t get to see them until they bloom. I choose them from a color chart at Rogers. When they do bloom, I get bouquet after bouquet to enjoy with a scent that can only be called “heavenly”. Winter and white go together …I guess because it makes me think of snow. I’d like to contemplate having a white garden someday, or maybe mostly white. I love white gardens! I find them enchanting. You can blend whites, grey or pale green, both foliage and blooms to create a wondrous garden from the tall…to the small. The fun is leaving some spaces to fill in with new varieties as you find them, leaving enough room for grace and surprises. Speaking of surprises, we just spotted those beautifully stripped Caterpillars on our Milk Weed! That was a happy surprise so early in the year… meaning we can look forward to getting Monarch Butterflies in the spring. I always enjoy our time together. Wishing you a new year of surprises. 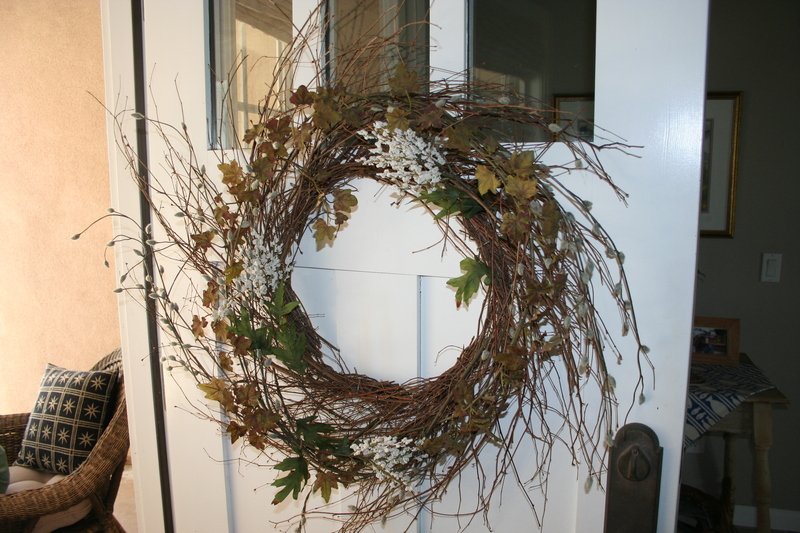 A wreath on the door is welcoming, friendly and adds a touch of charm to your entry. Before the door is even opened, it sends a hug or handshake to your guests. Wreaths can have many personalities, so it’s good to pick one that represents you. Take some time to choose the “bones” of your wreath. I personally love the twig wreath. It can represent all seasons with a few simple adjustments. First you might need to browse the internet or hobby store for a wreath that has the basic structure and appearance you want to convey to your guests. Of course, the option of buying one pre-assembled is a short cut you might want to consider. You can get ideas from images on line, or magazines before you begin your process. However, I’ve been known to emotionally engage on the spur of the moment while I walk the isles of the craft store or art mart grabbing rolls of ribbon, berries, dried leaves or flowers and grasses to intermingle as i begin to get inspired. It’s such fun; I just get it and keep it for other projects (they make wrapping presents a lot more fun) or to change out my wreath’s appearance another time. We have reached that ‘twixt time of year when we can decorate for fall, or falling into Christmas. I’m planning on adding some Christmas twinkles to my wreath pictured above. I love simple, so it may have very slender ribbon strands, snatches of berries and maybe some tin stars…or rustic bells. I’m getting excited to start already, but I don’t want to rush Thanksgiving out the door before it begins. I hope you enjoy your project…I always recommend making a cup of tea or hot chocolate, unless you prefer a glass of wine to enjoy while working on your wreath. I’ve been known to put on an old classic movie or turn on some music to balance my manic creativity. PS…You might want to have a wreath making party! Set a date, invite a few friends to join you and bring the bones, etc. for their wreath…set out your refreshments and make some memories. From beginning to end, fall is a cornucopia full of fun. Here in southern California the change in leaf color is barely noticeable, but you can find it in a few variety of trees. Living near Fallbrook, I love the way the gold shines out on our little, windy roads that lead into town. Even the local vineyards turn to gold. Pumpkins begin to show up in front of grocery stores and Lavender Hill Pumpkin Farm opens with its amazing varieties in all shapes, sizes, and colors spreading throughout in their growing ground. Mike is the seed collector and business man, while he is often joined by his wife who loves to play her guitar and sing folk songs for the children…and often adults find her enthusiasm delightful too! I love to begin buying pumpkins to use for decorating from September through November. I feel like a kid in a candy shop as I begin to pick my pumpkins for their color, size or unusual patterns. I put them both in and out of the house to welcome the season. Decorating with them can be an art in itself. I love to use burlap or plaid fabrics in fall colors on tables, in wheel barrows, boxes or draped over cabinets or tables covered with nuts, gourds and…of course, pumpkins with big, fat candles or luminaries to add fall intrigue to the display. Then, I bring out any wooden bowls or bright colored pottery I’ve gathered through the years to find the right look for my pumpkins. I like to contrast oranges with deep blue and white. Outdoors, they wind up in boxes, cuddled together on the patio, or randomly placed in the garden. 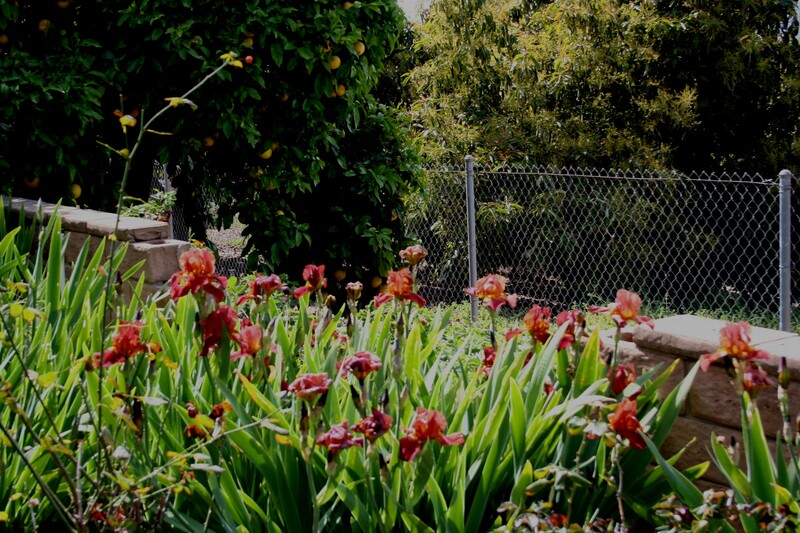 We have been known to take a little tip to central coast to visit “Avila Farms” to see their mounds of pumpkins and to “See Canyon Apples” to celebrate fall. Then, in October we can add the fun of Apple Season! I love to visit the Apple Farms in Oak Glen or have Apple pie in Julian. I even begin making pumpkin bread and apple pie as time allows. On top of that we have Halloween to enjoy. A soft plastic skeleton or bat finds it’s way to the garden or front porch lending to the fun. I formerly lived in a neighborhood where the mailbox was up by the door on our front porch deck. When I had outgoing mail, I tucked a waxy, fake hand into the mailbox holding my outgoing mail to have a little fun with our mail carrier… OK, that might be going a little overboard, but it was fun and I had kids at home to enjoy my mischief. Halloween is scary fun…a time for dressing up just to be silly and laugh…to pop out and go Boo! I loved to hang the black cats, witches, and bat drawings the kids made on the fridge. How about you? The fun still lives on through Thanksgiving with turkey, pumpkin and apple pie, corn-on-the cob, butternut squash, cornbread…should I continue? It’s a “fun-tastic” time when the chill hits the air and the fireplaces get lit…when trips to the mountains bring fall tree colors, and hot cider…when friends gather and we feel thankful for whatever abundance has come our way during the year. When kids giggle and get to carve pumpkins, and hand tracings turn into turkeys, it’s a time for heart- warming memories for me, and the fun lives on. Pumpkins can be very resilient …and I’ve been known to keep my best pumpkins out in the garden till spring! Wishing you a season filled with fun and happy hearts. For me, summer is a challenge. I really don’t function well in heat. That may be from living along the coast in Huntington Beach for many, wonderful years. After transitioning to rural North San Diego County, I discovered my adaptability to the heat of summer challenging to say the least. However, I have learned to use my ingenuity to work around the heat. I look for the pearls, hunt for the treasure, or search for a star in the midst of the haboob of summer. I tend to do gardening in the evening as a treat after a hot day…or take a trip to the beach after the crowds and heat have gone. You get to walk along the water seeing the remnants of sand castles, or take some wonderful photos of kites still flying, surfers out for their final rides of the day, a peaceful fisherman with his line cast, or couples walking hand in hand at sunset. I take my camera, or phone along; it allows me to capture life, emotions, dreams, and the peace of the shore at dusk. The sound of the surf rolling in ad out is a soothing balm at the end of a hot day. I just discovered that spring cleaning can be done in the heat of summer with the blessed air conditioning on! This discovery happened quite by accident! I had back surgery in mid-April with a 3 month recovery plan that has slipped into summer. Now that I’m reaching that mark & planning on finding a path to normal, I’m using some valuable time indoors cleaning out cupboards, closets, draws, & more! As I re-organize, I evaluate need. I find it cathartic and much like having a fresh start for my back…my living “spaces” are getting a fresh start, as well. Summer, can also be a great time to try new “light” recipes that require simple preparation. Salads are a great staple, especially if you’ve started your own garden. You can have pasta salads cold or warm (I’ve recently discovered uses for dried tomatoes) …and veggie salads with dried cranberries or blueberries, green salads can have shrimp, chicken or beans added. I love simple cooking in the summer…and sitting outdoors in the evening with your simple dinner, a nice glass of wine, iced tea or fresh lemonade watching the sunset! If you have kids or grandkids, you can make bird houses for the garden in a snap by pre-cutting the sides and roof, buying some paint and brushes in several sizes and glue and screws or nails to assemble! That way they can paint and decorate them with gusto. The internet is a great resource for ideas. There were also many easy and fun ideas on bird feeders. Another fun project I saw was gathering stones at the shore (or buying a package of assorted sizes) and paint rocks…you can even make a “rock garden” by getting some paint pens and making your rocks look like cactus! Then fill a small glazed pot with sand and “plant” your cactus stones! Making stepping-stones out of plaster of paris, or cement with hand or foot prints can also be fun! They can be round, square or heart-shaped. Make sure you have shells, beads, coins, etc. for decoration. With projects like this, you can have as much fun as the kids and make great memories in the process! One of my favorite past-times in the summer is reading…I love a good book store & recently found one on Coronado Island! It’s called “Bay Books” and is a treasure for book lovers. In fact, so is a trip to the Island! We walked through the little town, and up and down neighborhood streets, along the shore and felt the breeze. We found restaurants, and the Hotel Del, unique gift shops, candy stores, and more, but my favorite was Bay Books! Sometimes I browse on-line and cheat myself out of the fun of a book store experience. But it does give me the advantage of downloading a sample of the book before purchase. My tablet is light and portable, easy to charge up and takes pictures too, but it doesn’t replace that feel of holding a book, using a bookmark and putting it on the shelf like a treasure when I’ve finished it. I must share with you about my love for puzzles. If you get a light piece of particle board and cover it with contact paper, set it on a table and buy a couple of awesome puzzles, it can be fun for the whole family …or just you! It can sit waiting for the right moment, or friends to come by, or a relaxing moment, a break in your day…a date after dinner. Puzzles are fun anytime of the year, but when it’s hot outside; it makes for fun inside….no pressure to finish, since half the fun is that special “time-out” with your puzzle. This idea comes from a time in my life when my kids were around and neighbors were next door. But thinking about it has resurrected nice feelings & happy memories to share. I discovered drawing books at Barnes and Noble! They had books with a suggestion and space to draw something new each day (or how often you want)! What fun…you don’t have to be a great artist to play, but what a great challenge. I just found the one I purchased and got out a set of pencils. I’m going to take the plunge and explore the world of drawing. One of my plans, for this summer was to take an art class! I had to take a time-out for back surgery, but it’s still on my list. If it turns out that it’s still a possibility, I will make sure the class is air-conditioned! Check online or ask friends if they know of classes available. It’s fun to start something new to stay fit, but that can be challenging in the summer. However, there are options like a Yoga Class, or evening Tennis, or early morning Golf. Since summer isn’t over yet. I’m hoping to get the “OK” for getting back to Yoga. I’ve also seen several runners along the beach in Carlsbad, as well as, walkers. I find that exercise that is fun produces better results than the drudgery or chore of other methods. I walk better with music. It starts my happy engine helping me put some pep in my step, and it’s a great stress reliever. So far, I’m not in my usual peppy walking mode yet. I do better on the tread mill, but not chalking up more than a mile and a smidge. I won’t give up….better things are yet to come (I hope). Originally, Tom and I had planned to learn to SUP this summer. I figured we’d fall enough to stay cool! Maybe that can be a plan for next summer or fall. I’m glad I got up the courage to move ahead with the surgery, rather than continuing to delete some of my favorite activities. I hope my ideas above prove fruitful in your life. I try to plant seeds, hoping to hear that they are growing in the lives of the people I care about. Sharing Ideas are like a community garden that brings blessings to everyone. With spring transitioning into summer, our blackberry vines first produced clusters of white blossoms to create the anticipation of berry-picking. Visions of fresh blackberries sprinkled on vanilla ice cream is a yummy thought, so is fresh berry pie, or pancakes topped with berries and whipped cream, but my favorite way to enjoy our blackberries to eat them fresh picked from the vine warmed by the sun. We inherited our patch of blackberries when we moved into our house. It was a big, old, run down house in need of a transformation. We didn’t know where to begin! We found a contractor and made lists. With the contractor’s guidance, we began a great adventure. It was November…Thanksgiving weekend when we moved into our fixer upper. We had one working bathroom while the other two were being renovated. We needed to keep warm, so we had two wood burning stoves and a new heating and air system installed to survive. I was soon lost in paint samples, popcorn ceiling removal and floor samples. Double paned windows were ordered, and installed, Christmas came and went, and renovations seemed to be all encompassing. It seemed the more we did, the more that needed to be done. When spring came, we discovered a small miracle. We had blackberries…sweet, plump, delicious blackberries! It was like a wonderful gift that needed no renovation on our part. The crop was abundant. We now moderately care for it. It has good years and not so good years, and sometimes the birds battle for the bounty, but whatever we get, we remember that first wonderful year of discovery. Sharing it’s abundance with friends and family was an unexpected treat and every spring I’ll always remember that patch of green stuff on the other side of a short rather unattractive block wall down a north facing slope that turned into a beautiful gift after months of plowing through decisions, dust, clutter, and a house full of workers helping us turn an old tired structure into a home, while we developed the surrounding land into a nursery…first, Daylily Hill and now, Waterwise Botanicals Nursery and Gardens. I love small cottages, with their cozy charm, the kind you find in small towns or historic communities within a city. They are so charming, but often are on a small lot with limited gardening space. Also, popular and sought after beach front housing around small coastal communities, marinas, and bays often have compromised yard space due to the compression of building as many homes into small, cozy, or prestigious areas as possible. In our urban communities more and more yard space is limited with the construction of duplexes, condos, and townhouses with shared park-like green space leaving very little plant-able “personal” space. them a more personal touch or going for the earthy natural style of metal or wood. If you choose wood for planting, be sure to line your planter with plastic. Rolls of plastic are easily found in the paint department of most hardware stores, as well as nylon screen for the bottom of planters and pots, so you don’t wash out planter mix or soil. If you have space for a small trellis or overhead patio cover, you can have vines or hanging pots for color. A baker’s shelf, often found in antique stores or vintage shops, can provide shelving in a delightful venue for setting pots and planters, or…a simple old wooden ladder propped against a wall or a free standing ladder can become a charming potted plant holder taking up very little space. Just give it an inexpensive coat of paint and select a place in your unique growing space. Fences can be an opportunity for attaching a plant pocket, or partial rain gutter for herbs, succulents, or seasonal color depending on personal preference and exposure considerations. Also, finding a 3-tiered fountain makes a great planter and can add some height for a unique and creative planting. If you are lucky, you can find one on line that someone wants to get rid of…”what a find”. Old wooden pallets can become incredible planters for succulents and take up very little space, by attaching ground cloth to the back, adding some potting soil and planting in the cracks, while cuddling in the succulents with damp moss. A simple old wooden ladder propped against a wall or a free standing ladder can become a charming potted plant holder taking up very little space. Just give it an inexpensive coat of paint and select a place in your unique growing space. Here are a few images that might give you some inspiration. Even a small balcony or porch can become your “Garden of Possibilities”… your “Peaceful Citadel” with a little imagination. I hope as always that I have touched that earthy part of your soul that loves gardening… that transports you to the happy place in your corner of the world you call home. May your creativity keep growing, as your hands keep diggin’ in the dirt.